Yeah we got to go to the country of Monaco on the "Best of France" trip. Strange but glad! I was very fortunate to get to visit France over two weeks at the end of October. This could be a year's worth of posts in terms of what we did, how it happened, and so forth. But in the spirit of #Hashtag59 being outside more than on the computer I'm going to consolidate it to a 2 part series with my 10 favorite things that we did over the two weeks! Overall we had an amazing, once in a lifetime you could say, trip and France was not on my radar to be honest until we noticed direct flights from Cincinnati (CVG) to Paris (CDG). 1. We were strapped for time prior to the trip and chose to go with Trafalgar that got us from point A to point B. While you miss a small bit of adventure it was made up for by a top notch tour director (what up David! ), incredible itinerary, the ability to nap, read books, and connect with people from your group from all over the world! We had people aged from 25-76 from over 6 countries on our trip which was splendid in terms of connection and making new friends, and a TON of Aussies! I have found Aussies to be "Iowa Nice" combined with a bit more sense of adventure than a Midwestern farmer. A great combo! 2. The French people get a bad rap sometimes in my eyes. I hear "well you have to know French" or "they wouldn't speak English". Guess what?! You are in France! And we actually did not run into this AT ALL; every person we connected and talked to in France was over the top kind, open hearted, and helpful if it called for it. I did learn about 50 words/sayings prior to our trip which I put into heavy use and picked up about another 25-40 words being there talking to the French. I recommend doing this for any International Travel out of respect to the country/people you are visiting, the joy of learning, and the ability to communicate better once there. The Coffee Break podcast is my go to for this! 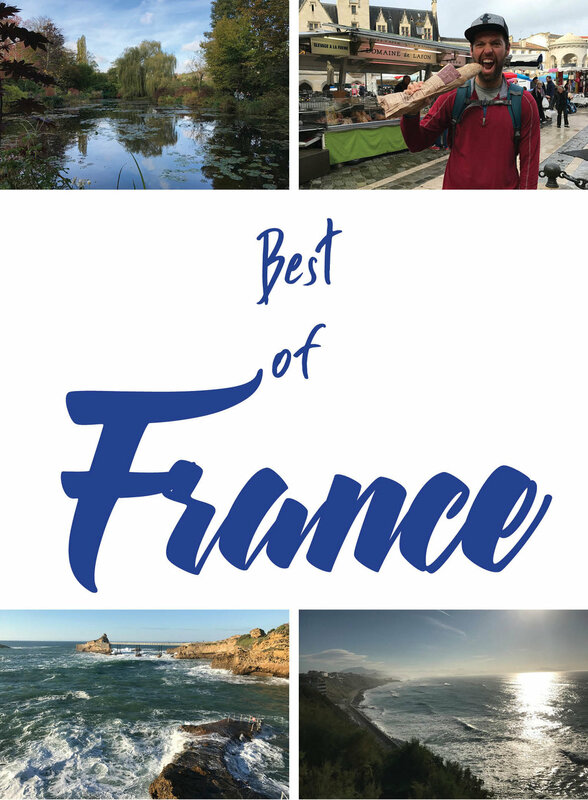 Now onto 10 thru 6 of my Best of France! This beautiful town is the capital of Burgundy's wine country. The Escargot was on point and the tour we took of the "Hospices de Beaune" was simply fascinating. The yearly wine auction held here demands some of the heaviest prices of wine I have ever heard of, but it's all for a good cause! Number Nine: Paris Rollers Marathon! We just arrived in Paris and low and behold we see thousands of people racing in roller blades along the Siene River bank. Turns out Paris has a yearly Marathon on Roller Blades. I'll be back next year for that I hope, it was fun to see adventure travel happening right upon entering the country! This town in Southern France has an old fort with a ton of history, and unfortunately, bloodshed within its walls. Touring the fort and then spending the night in a CASTLE was COOL! Lourdes is a small town lying in the foothills of the Pyrenees mountains that is a major Catholic pilgrimage site. Regardless of your religion/faith/lack there of it was a fascinating place to be at and to see the passion and intensity of what is going on there. The pilgrimage stems from a young woman named Bernadette. Number Six: Peace Yoga Nice! I cherished our two days on the French Riviera (especially our day with no driving!) The highlight was finding this Bikram Yoga Studio on the 4th floor of a hostel. The class was done in both English and French and as a Yogi I loved the fact that I was halfway across the world and had immediate connection and love from people I had never met because of yoga. Look them up when you get to town, they do have mats and towels available for rent! I'll be back with part two of my top five next week!